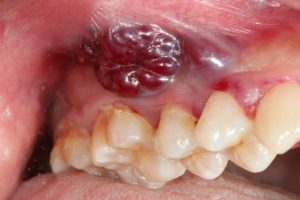 We need to talk about oral cancer. The nonprofit organization The Oral Cancer Foundation estimates that 48,250 Americans will receive an oral cancer diagnosis in 2016 alone. 3,887 of those cases will be in Houston. Will you or someone you love be affected by the disease that kills one person in the United States every hour? Learn more about oral cancer today — doing so could (literally) save your life. Too many adults receive a late diagnosis for oral cancer simply because they are unaware of the symptoms of the disease. Educating yourself on what to look out for can greatly increase the chance that you will seek a diagnosis and treatment as soon as you notice something is off with your oral health. And knowing more about oral cancer benefits you and those you love, too. The symptoms of oral cancer are varied, and this list is by no means exhaustive. A good rule to live by is this: if you notice a significant change in your oral tissues, or if there’s something that just strikes you as a little odd with your oral health, don’t hesitate to get screened for the disease. Spread the knowledge — take some time to talk to your family about the symptoms of oral cancer, too. Early detection is vital to successful outcomes in oral cancer. Adults over the age of 55 should undergo one oral cancer screening per year. People who have the risk factors for oral cancer should be especially vigilant about their screenings. The risk factors of oral cancer include age, tobacco use, family history of cancer, alcohol consumption, and more. Let your dentist know if you have one or more risk factors of oral cancer. The oral cancer screening is a quick, painless procedure that can be completed alongside your regular checkup and cleaning. It’s a visual and tactile examination performed by your general dentist. Let the office know you’d like to get screened for oral cancer when you schedule your appointment and they will set aside time to do so. In the screening, your dentist is on the lookout for the irregularities that could indicate oral cancer. First, he or she will ask you a series of questions — because no one knows about your health better than you. Then, the exam will be performed. Some things your dentist is watching out for include lumps, bumps, odd textures, asymmetries, and other symptoms of oral cancer. If any suspicious areas are discovered, further examination with a biopsy will be recommended. Your oral surgeons in Houston perform biopsies for oral cancer as well as other procedures related to its diagnosis and treatment. And now more than ever, we are committed to improving outcomes with oral cancer by raising awareness of the disease. Let’s get the conversation started — schedule an oral cancer screening with Dr. Steve Koo of Piney Point Oral & Maxillofacial Surgery in Houston, TX today! by: Dr. Steve Koo at July 11, 2017 .